Drone warfare is a uniquely contemporary issue that is still plaguing many countries, especially those in the Middle East who find themselves consistently in the crosshairs of drone pilots. There is a coldness, a brutishness that seems to icily infect anyone this form of warfare touches. 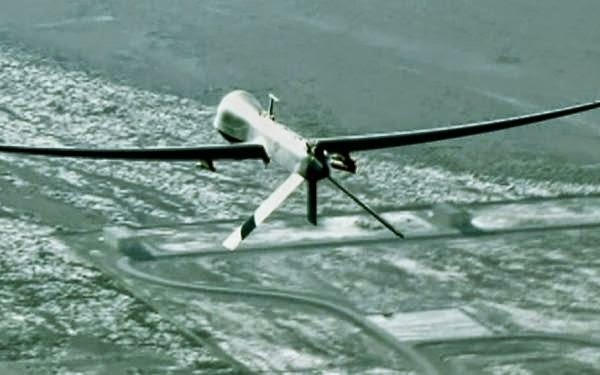 In Drone (2014), Tonje Hessen Schei crafts one of the most effective, in depth and well-rounded documentaries on the state of the war on terrorism today. Clinically-minded, touching on all the landmines of technicality embedded within its subject, this is a film that seeks to punch above its weight. The urgency in its voice throughout is enough to spur on any human rights activist in the middle of a viewing. And much like the eponymous objects of destruction, Drone takes aim at the status quo of drone warfare and constantly works to tear it apart. Schei achieves a consistent balance in her viewpoints. She trains her lens on the drone-stricken lands on Wajiristan, where the people there face the most strikes per day – more than any other country of interest. She brings us to the base of operations: the United State of America. There she focuses on the guilt-stricken men who sat day in and day out, behind a screen, aiming the artillery at targets that, at best, were highly educated guesses. She interviews weapons manufacturers, ex-government officials who created the policies and protocols of the combat operations, human rights lawyers fighting for the safety of those unwilling civilian targets. Through all of the harrowing testimonies and intricately crafted arguments, viewers are faced with a sincere moral dilemma: how can we stop the war on terror? It’s a simple question in itself, but the finer points, the political motivations, the emotional and mental warfare that seems to be brought into the mix all place heavy blockades on the path to finding a simple answer. Where the documentary is by far most successful is when Schei captures the testimonies of former drone pilot Brandon Bryant and the locals of Wajiristan. Here are the human faces to a never-ending war on terror (which Schei arguably portrays as now merely a war of finger-pointing and hastily enacted preemptive measures). In both of these storylines, the pain and fear of past horrors haunts, deeply and fully. There is no escaping the memories because these men, women and children bear the physical and psychological scars. There are children who can no longer go to school because of the frequency of strikes. There are roadside cemeteries with growing numbers of residents. The anger and pain of those in Wajiristan is mounting to intolerable levels, as Schei portrays it. Drone as a documentary effectively carries out the goals of its genre framework: it delves deep into the heart of a pressing matter, fully exploring and sussing out every angle. It presents a thoroughly argued thesis that drone warfare is currently more harmful than helpful. Through equal measures of pathos and logos, it is truly successful.